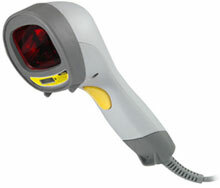 The ZBA ZB3060 is an omnidirectional handheld laser scanner which can be used in a multitude of applications. When scanning multiple barcodes on a single object, this high performance device allows users to switch to a single line scan by simply pressing one button. The ZB3060 comes with an adjustable handsfree stand and reads barcode labels at any orientation using an aggressive 1400 scan lines and 74 scans/sec. laser engine.